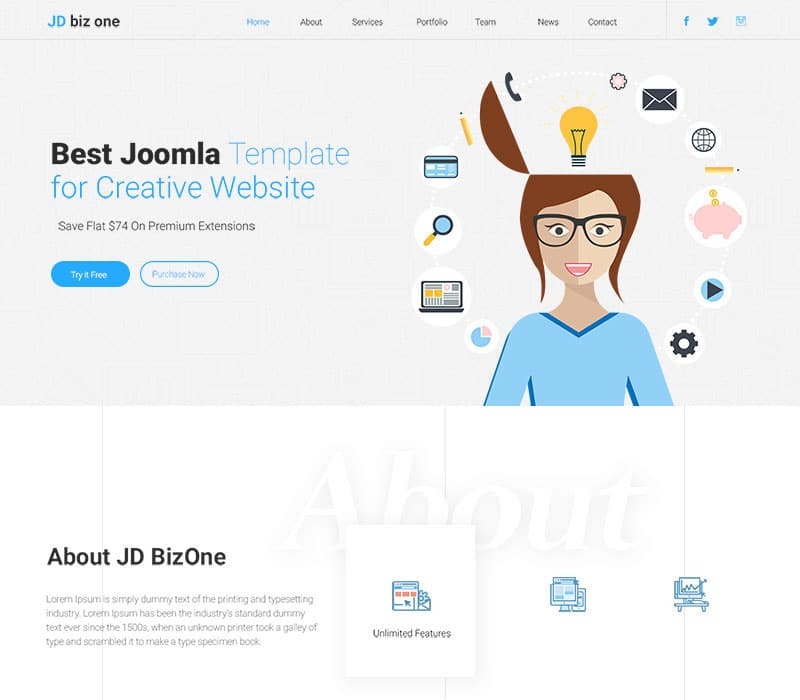 JD BizOne is a most advanced One page multipurpose Joomla template, flawlessly fits on any business website whether it is small agencies, startups, and multipurpose business websites, it suits perfectly. It is cleanest themes, comes with a massive number of features that allows you to create a professional looking website. This one page Joomla theme is powered by Helix framework and integrated with some powerful extensions Quix page builder and Smart slider pro that allows you to make a robust top notch website. With JD BizOne, you can choose multiple catchy pre-built color options to choose from. You can even add or delete any color as per your needs. JD BizOne loads in the blinks of eyes. Lightweight and faster browsing experience helps to maximize customer retention rate. The ultra-responsive design will make your website look great on any device. Included are sections for pricing tables, testimonials and portfolios so that you don’t have to rely on third party plugins. Currently, JD BizOne is on sale for $39 at JoomDev. With that, you will get future updates and 6 months support ftom the theme developers. You can also download the free version before you buy. Once your payment is complete your account is immediate active, this generally takes less than a minute to occur. JD BizOne comes packed with quickstart package with demo data installer (Joomla 3.8, recover template, used extensions, demo content – all included). Once you install the quickstart, you’ll have a replica of the live demo. JD BizOne is an engaging and creative one-page multipurpose website template. An amazing platform for the creation of sophisticated modern websites in a variety of industries. Requiring absolutely no coding skills in order to accomplish professional quality results. If you prefer the simplicity of a one-page site, this is a very good option. Maybe you are a designer, a photographer, or an illustrator who needs a blog or a portfolio that is simple and easy to see like a one-page website. Well, you are in the right place.